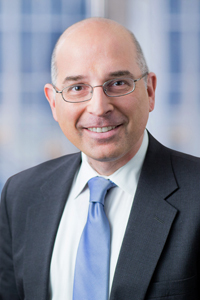 Jeffrey P. Resnick is a shareholder in the Litigation department. He has significant experience handling all phases of litigation across the country, tried jury and nonjury cases and argued appellate matters in State and Federal Courts, including the New Jersey Supreme Court and the United States Court of Appeals for the Third Circuit. Medical professionals in hospital and board disputes. Montgomery Academy v. Kohn, 50 f. Supp. 2d 344 (D.N.J. 1999), affirmed 82 F Supp. 2d 312 (1999), Successful Motion to Disqualify Counsel due to existence of a prior attorney- client relationship and obtainment of confidential information. Rios v. Rockwell Int'1 Corp., 268 A.D. 2d 279 (N.Y. App. Div. 1st Dept. 2000) Obtained summary judgment dismissing plaintiff's failure to warn claim relating to a personal injury sustained on machinery. 1600 Penn Corp. v. Computer Scis. Corp., 2009 U.S. Dist. LEXIS 76764 (E.D. Pa. 2008) Obtained summary judgment on tenant's claim that landlord's purported termination of the Lease was invalid and ineffective. Forman v. Salzano (In re Norvergence, Inc.) 405 B.R. 709 (U.S.B.C. 2009) Represented defendant, a leasing company accused of operating a Ponzi Scheme. 135 Route 73 S., LLC. v. Schafer, 2010 N.J. Super. Unpub. LEXIS 2540 (N.J. App. Div. 2010) Successful Motion for Summary Judgment and appellate affirmance regarding a real estate transaction. Mintz v. Dietz & Watson, Inc. 2010 U.S. Dist. LEXIS 118781 (S.D. Ca. 2010) Obtained summary judgment and defeated a Motion for Reconsideration on a patent infringement matter. Rosenberg v. Lincoln Fin. Group, 2010 U.S. Dist. LEXIS 36132 (D.N.J. 2010), affi'm on reconsideration 2010 U.S. Dist. LEXIS 112667 (D.N.J. 2010) Obtained summary judgment on behalf of an employer defending against violations of COBRA. Sanchez v. Rizzieri Consulting, Inc., 2012 N.J. Super. Unpub. LEXIS 2381 (N.J. App. Div. 2012) Obtained defense verdict at binding arbitration and successful defending appeal in representing employer in FMLA and New Jersey LAD Claims. Schummer v. Black Bear Distrib., LLC, 965 f. Supp. 2d 493 (D.N.J. 2013) Obtained summary judgment for employer in FMLA and New Jersey LAD Claims. Grossman v. Board of Review, DOL, 2015 N.J. Super. Unpub. LEXIS 1000 (N.J. App. Div. 2015) Successful denial of appeal from final agency decision of the Board of Review, upholding the Appeal Tribunal's determination of proper classification of independent contractor rather than employee. Admitted Pro Hac Vice in numerous states including, California, Connecticut, Delaware and Florida. Named to New Jersey Super Lawyer “Rising Star List” for Business Litigation, Insurance Coverage and General Litigation (2006-2010). *The Rising Stars list is issued by Thomson Reuters. A description of the selection methodology can be found at https://www.superlawyers.com/about/selection_process_detail.html#rs. No aspect of the advertisement has been approved by the Supreme Court of New Jersey.